𝒢𝑜𝑜𝒹𝒷𝓎𝑒 𝒷𝓊𝓉𝓉𝑒𝓇𝒻𝓁𝓎 5 years ago today my life changed forever. I had my thyroid, a parathyroid, and 10 lymphnodes removed due to cancer. Shortly after my surgery I received my first dose of radioactive iodine. Nothing could have prepared me (or anyone for that matter) at such a young age to undergo the surgery and treatments. The past five years I spend hours upon hours getting lab work, ultrasounds, biopsy’s, injections, CT scans, and radioactive iodine treatments. My doctors did not prepare me that the battle would be far from over after they removed my thyroid. They failed to tell me how sick I would feel for years, the struggle I would have with my weight, and lack of energy. They didn’t mention as they balanced my hormone levels with medication I would become depressed, fatigued, I would have skin issues, my hair would thin out and never feel the same again. I didn’t realize that removing one small little butterfly shaped gland could wreak so much havoc on my entire body. I thought my one little thyroid pill (that I will have to take for the rest of my life) would just substitute what I had lost, but It didn’t. My body rejected my thyroid medicine multiple times and swung me into hypothyroidism leaving me wondering what feeling normal even meant anymore. Even though it was hard and I wanted to give up so many times, I just kept pushing through and staying positive. I had my fair share of ups and downs but eventually I have always found my way back into the light. I decided to share what I went through in hopes of inspiring someone and remind them that they are not alone. I also share the truth about thyroid cancer on educating others about the challenges thyroid cancer patients are faced with. Even though it’s been five years I still suffer from extreme fatigue and staying in shape is a constant battle. The lab tests and ultrasounds that I still undergo have become a part of my new norm. It is as much a mental battle as it is physical & have to remind myself that I need to listen to my body and there are going to be days that I am not OK and that is fine. I am thankful for my life and that I am still here to live it. Last Saturday I took a trip down to San Diego to visit my sister. I decided it was the perfect place to do the virtual 5k I signed up for with Run on a Mission. 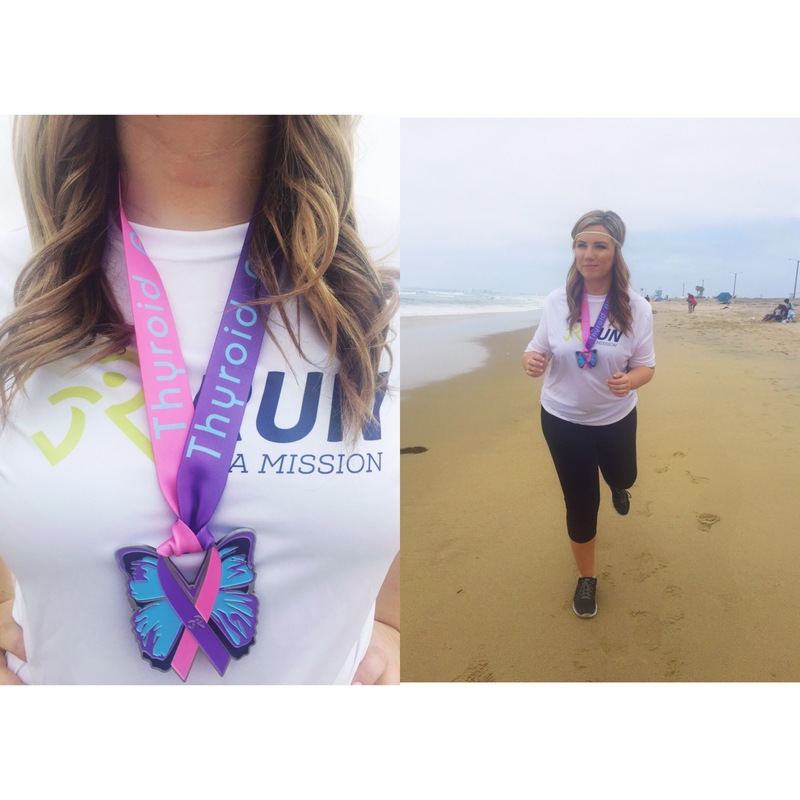 This race was for Thyroid Cancer Awarness so I was extremely excited to participate! 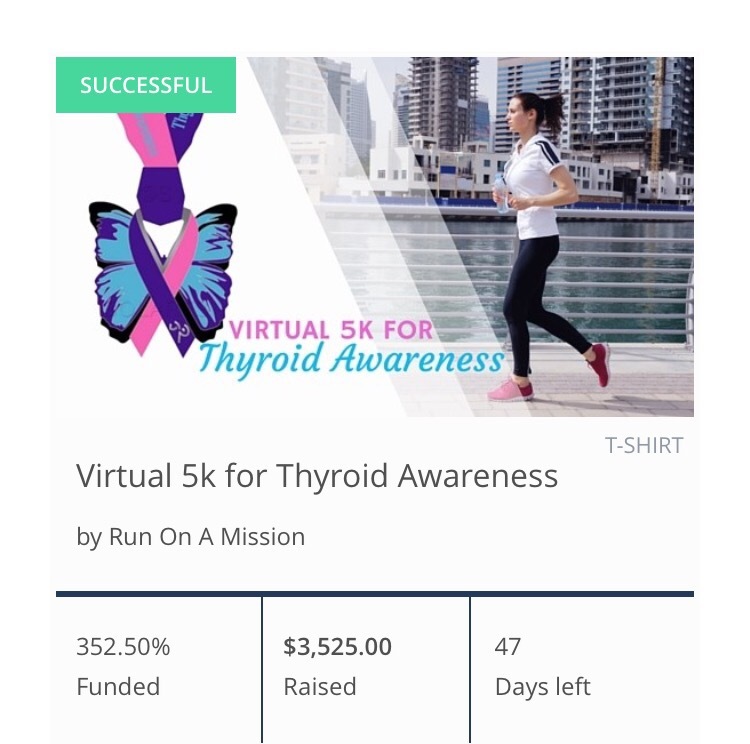 One of the founders has a daughter who was diagnosed at 13 years old and is just starting her journey without her thyroid! One of my personal goals is to become a stronger runner, which hasn’t been easy. I liked this race because you could do it at your own pace anytime, anywhere during the time frame. 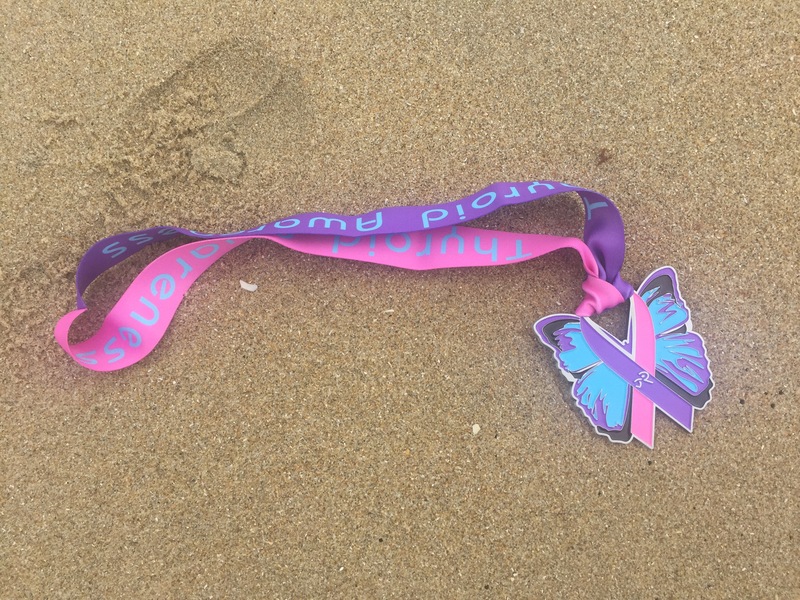 I received this beautiful medal and a T-shirt for participation with my donation! The race was only funded at 23% when I signed up so I did whatever I could to help spread awarness! As of today the race is at 352.50% funded and a total of $3,525! After taking pics in action I now have a new founded respect for fitness and apparel models! I have another race coming up next weekend for StandUp2Cancer and I am excited to participate! Thank you again Run on a Mission for letting me be a part of your race!